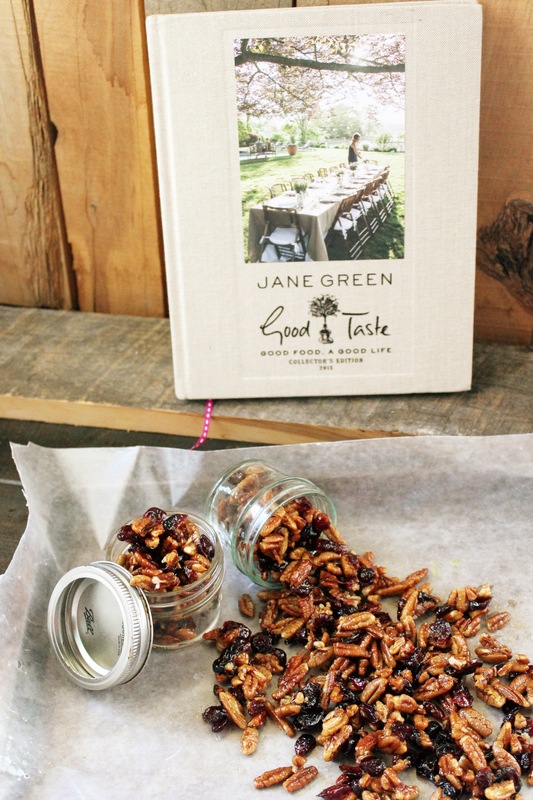 Jane Green fans rejoice that her cookbook is out. These Sweet and Sour Nuts are from her book and are perfect for parties or a hostess gift. I am an avid reader. Seriously. I always have a book on my iPhone, hardback and either audible or cd book going. Sometimes all at the same time. Her recipe for Sweet and Sour Nuts would be perfect to eat while reading one of her books too! And one of my favorite authors is Jane Green. She is one of my have to buy authors. Her books are real and always deal with a real-life problem. Recently I saw a post on Jane Green’s Facebook that her cookbook, Good Taste, was coming out. Having been an early backer of her cookbook on Kickstarter, I was so excited to learn that she was having it published again for those folks who weren’t able to get in on the early promotion. I’ve made one of Jane’s recipes before, and loved it so I knew I had to have this cookbook. It is beautifully written, has wonderful vibrant photos and the recipes are simple yet scrumptious. For this review I went with Jane’s Sweet and Sour Nuts because I have been on a pecan kick lately. The citrus adds a nice burst of flavor to the dish and these can be served at a party or put in mason jars for gifts. If you haven’t read a Jane Green book, do it. And if you like audible books, she reads her own and her accent is divine! 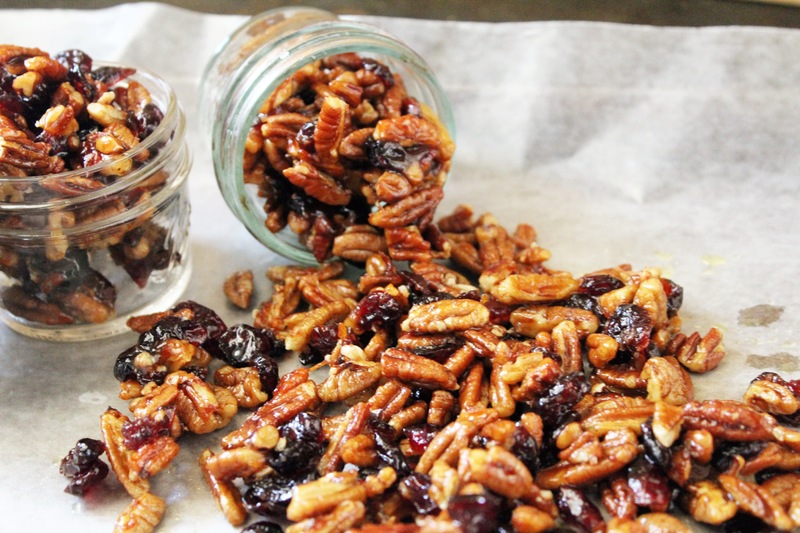 Sweet and Sour Pecans and Cranberries cooked to golden perfection make the perfect appetizer for your holiday meal. In a medium bowl, mix together orange zest and juice, lemon zest and juice, olive oil, honey, brown sugar and vinegar. 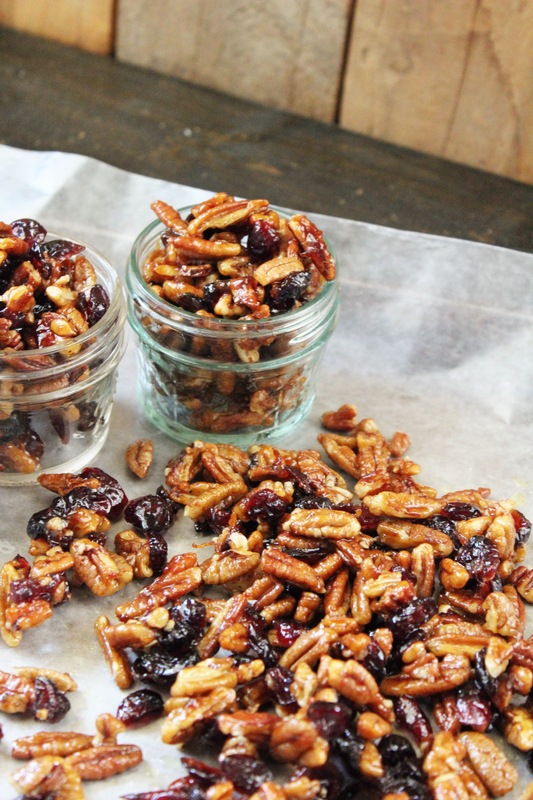 Toss in pecans and cranberries. Mix to combine. Prepare a large baking sheet with parchment paper. Pour pecan mixture on parchment paper and spread out. Remove from oven and move nuts around with a spatula to break up. Thank you to Jane Green for providing a copy of her cookbook, Good Taste, to giveaway to one of my readers. Note: There are affiliate links to the cookbook and Jane’s books because I think you should all be a fan! Amazon gives me a teeny, tiny commission if you click on those links. It helps pay for the hosting of this website. Thanks! « Who is ready for Chocolate? It’s #Choctoberfest 2016! That was a favorite of mine too. Please leave your email in case you win. My Favorite book this summer was First Comes Love by Emily Giffin. Jane is coming to SanDiego in a couple of weeks and I hope to see her here. I have that book but I'm saving it for an flight so I can savor it. Can't wait! Jealous you get to meet Jane! Hi Bridget, I just emailed you that you have won the cookbook!